Do you have an experience-based recommendation? As it currently stands, this question is not a good fit for our Q&A format. We expect answers to be supported by facts, references, or expertise, but this question will likely solicit debate, arguments, polling, or extended discussion. If you feel that this question can be improved and possibly reopened, visit the help center for guidance. If this question can be reworded to fit the rules in the help center, please edit the question. ISAPI_Rewrite is a powerful URL manipulation engine based on regular expressions. It acts mostly like Apache's mod_Rewrite, but is designed specifically for Microsoft's Internet Information Server (IIS). ISAPI_Rewrite is an ISAPI filter written in pure C/C++ so it is extremely fast. ISAPI_Rewrite gives you the freedom to go beyond the standard URL schemes and develop your own scheme. Managed Fusion URL Rewriter is a powerful URL manipulation engine based on the Apache mod_rewrite extension. It is designed, from the ground up to bring all the features of Apache mod_rewrite to IIS 6.0 and IIS 7.0. 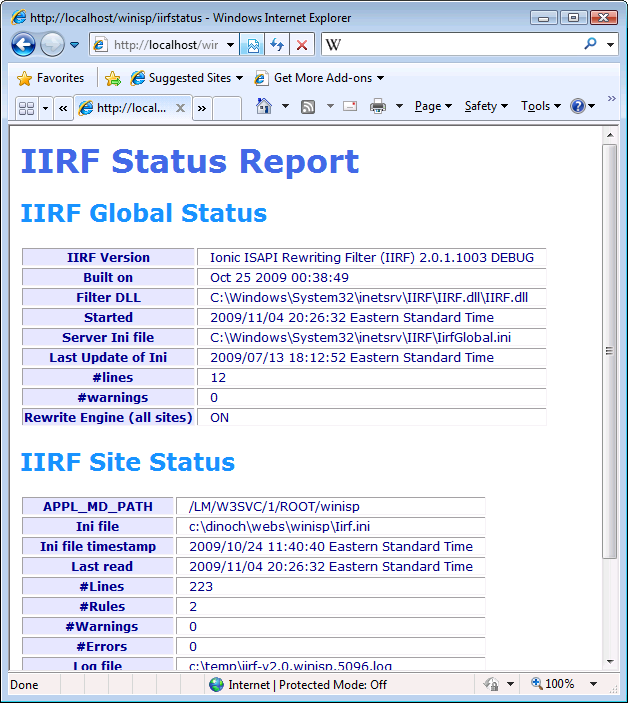 Managed Fusion Url Rewriter works with ASP.NET on Microsoft's Internet Information Server (IIS) 6.0 and Mono XPS Server and is fully supported, for all languages, in IIS 7.0, including ASP.NET and PHP. Managed Fusion Url Rewriter gives you the freedom to go beyond the standard URL schemes and develop your own scheme. works with IIS5, 6 or 7. Did I mention it is Free? A pefect alternative to Apache mod_rewrite and other Apache modules on IIS7 is Helicon Ape. The syntax is 99% Apache compatible. http://www.iis.net/extensions/URLRewrite was designed for IIS 7.0 and features great performance and administration UI. IIS mod-rewrite is the best option I know, but it's not free. ISAPI Rewrite is suitable for IIS 5 or 6. There's a Lite version available for free, or you can pay for the full version to get more features, such as proxying capabilities. It's been a while since I've used it, but it worked fine at the time. I'm using Helicon Ape since jumped off from Apache and moved to IIS. It's syntax compatible with Apache. Not the answer you're looking for? Browse other questions tagged iis mod-rewrite or ask your own question. Is it possible to change the url of a static .html without changing the name of the file? Is it safe to rely on mod_rewrite for SEF urls? Does mod_rewrite only translate external requests to internal files and not vice versa? How to check if mod_rewrite is enabled in php? Laravel routes returning 404 after move from xampp to apache 2.4.7. mod_rewrite or htacess or missing apache setting?